Access to healthcare is among the most basic human needs. 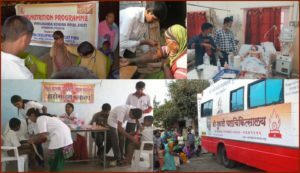 IDRF supports projects that provide healthcare in rural areas, towns and cities to those who cannot otherwise afford it. IDRF has supported mobile medical clinics in hard-to-reach villages as well as treatment centers and hospital. These programs also educate people on good health practices like healthcare for pregnant women, immunization, and family planning.